1. Financial power of attorney. This document authorizes an "attorney-in-fact" to act on your behalf in financial matters. 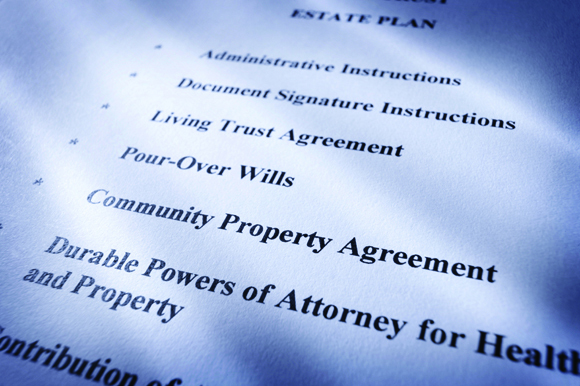 The most common power of attorney, a "durable" one, remains in effect if you're incapacitated. Another variation, which is known as a "springing" power of attorney, transfers control to the designated person only if you're incapacitated. The attorney-in-fact may have broad powers, able to buy or sell personal property, for example, or the role may be limited to specified tasks. This power of attorney expires when you die. 2. Health-care power of attorney. This also authorizes another person to make decisions on your behalf if you're unable to do so—in this case, involving medical care, carrying out your end-of-life wishes, and related matters. Here, the attorney-in-fact is typically your spouse, a child, or a sibling. Like a financial power of attorney, it may be broad or limited and expires at your death. 3. Living will. While a health-care power of attorney may authorize someone to help with end-of-life decisions, establishing what will happen when you're dying is the sole purpose of a living will. Depending on the laws of your state, you may be able to use a living will to say whether or not you want life-sustaining treatment if you are terminally ill or grievously injured. Also depending on state law, a health-care power of attorney and a living will may be able to be combined into one document. In other states, a living will may supplement a health-care power of attorney, and both documents can be coordinated with other medical directives or proxies. 4. Trusts. There are many reasons for creating and funding trusts. A trust could be used to prevent family squabbles or impose restraints on spendthrift family members. One variation, a living trust, often supplements a will because assets in the trust don't have to go through probate court proceedings. Though there are myriad variations, all trusts are either revocable or irrevocable. With a revocable trust, you retain control over the assets. Yet while that's not the case with an irrevocable trust, this type of trust can protect assets from creditors and remove them from your taxable estate. 5. Will. Last but not least is your will, which establishes how your assets will be distributed after you die and who will have custody of any minor children. You also could use it for other purposes such as making charitable donations and creating trusts. If you die without a will—"intestate," in legal parlance—the laws of your state will determine who gets your assets and assumes guardianship of young children. As the centerpiece of your estate plan, this is definitely one tool you can't be without.